Fiber To The Home ? What For ? Ever wanted to know if Dan Brown was right ? Click here. But better have a real broadband connection *, Buddy ! I just discovered the American Museum of Natural History website. The Science Bulletins section features amazing animations and videos on the Universe, Space, and Earth. It's worth bookmarking, sharing, and, of course, watching here. 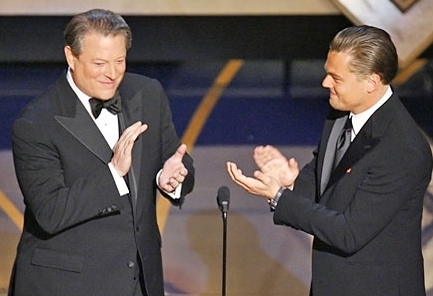 Al Gore and Leonardo DiCaprio tell Hollywood how the Academy goes green. (photo : Reuters). 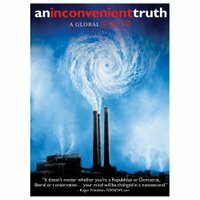 "An Inconvenient Truth", the documentary from used-to-be-the-next-president-of-the-United States of America Al Gore and director Davis Guggenheim on global warming has won an Oscar last night in Los Angeles, CA. In my humble opinion, the Academy' award is another strong sign that the combat against global warming is going mainstream in the US. An excellent news, that is a tremendous step forward to a complete overhaul of our way of life. 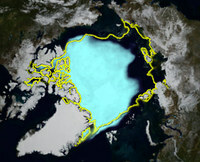 post-scriptum : the original article by Associated Press claims"An Inconvenient Truth" to be a power-point presentation. Well, the author doesn't probably subscribe to "PresentationZen", otherwise she would have known that it was designed and created using Apple' Keynote presentation app ! The Toronto-based online newspaper globeandmail.com has issued a Special report: The new climate. It is an interesting complement of Al Gore's Inconvenient Truth, for you can save the html files for education purposes. See the thrilling video here, about the World's most polluted city - Linfen, China. See some dramatic effects of Global Warming in the diaporama here. See also the beautiful illustrations describing how the planet is warming up, why Greenland will turn green land again soon, and how we can all make our house green. Bruno Gussiani of Lunch Over IP posted a very interesting article on how the seasonality of the fruits & vegetables has been neutralized by air transport. Reading this post, my early days with HP/Agilent came back to my mind. I was traveling all around Europe, Middle East, and Africa, I was three or four times a year in the US. No matter the place/country I was visiting, no matter the season, I could have the very same breakfast all over the Planet : tomatoes, berries, grapes, melons, whatever fruit and vegetable was available. I didn't realized that strange fact - how come you can eat strawberries in London in January - until a certain day in October 2000 (I was then almost 2 years with the company). I was coming back home for the week-end, and I saw the trees around : losing their leaves. It was autumn, and I never figured it out before. I didn't saw the whole year at all, except 3 weeks during summertime because of the Tour de France. I was working like crazy, I was traveling like hell (hey, 150+ boarding passes collected in Year 2K, that's flying at least twice a week ;-), and... I was eating the same things at breakfast all over the year. Something was wrong, right ? My take is that going Carbon Neutral will force us to change our habits dramatically. Work at an office close to your home, travel less and compensate each flight, and eat only season' s fruits & vegetables. Looks like we're back to 1950 !!! ps : another very interesting post on the same subject here, where Bruno describes how the concepts of "carbon footprint" and "carbon neutrality" and "carbon offsetting" have become mainstream in Britain. 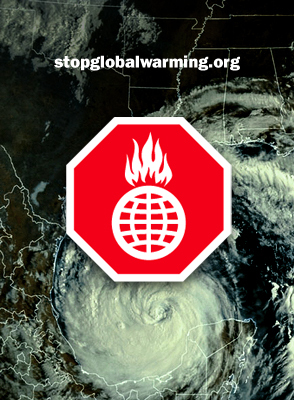 The Stop Global Warming Virtual March is a non-political effort bringing Americans together to declare that global warming is here now and it’s time to act. You can become part of the movement by clicking here. Thank you, on behalf of our children's children. French adventurer and television presenter Nicolas Hulot, also one of France’s most influential ecologists, has launched its lobbying campaign for the French Presidential Elections, scheduled May 2007. So called " Le Pacte Ecologique " ( " The Ecologic Pact " ), this campaign is pretty much on the same wavelength than Al Gore' s " Unconvenient Truth ". Something' s happening on this Planet, finally. No matter our political colors, there is only one thing that matters today : Save the Planet, for the sake of our children' s children. For my fellow French readers : please go here to sign up the Pact and watch (and listen to) Nicolas Hulot explain why we are all in danger. US residents and al. : please don't forget the Stop Global Warming Virtual March here. Thank you so much, on behalf of Mother Earth. My Wife and I went to the Gaumont Multiplex " Parc Millesime " in Reims to see " An Inconvenient Truth ", the movie that was a wake-up call for America and Global Warming skeptics all around the Planet. I cannot say more than what have been already said and written about Al Gore's traveling global warming show. The former Vice-President is really * a man with guts *, unlike too many people today. His presentation is a must for everyone above 14. How to take action here. Environment and green/renewable energies are one of my favorites topics of interest since a couple of years. I will come back to that soon, and often. For the time being, and to start with the subject on this blog, here is a pretty interesting video from Discovery Channel on Sunlight Direct's fiber optic sunlight transport system. That is the Future, Folks, altough William Wheeler patented the idea in... 1880 ! ps : it is interesting to see that first ideas are always the right ones, right ? Last August, Philips Research made the world-first demonstration of promotional jackets and furniture featuring its innovative Lumalive technology at the IFA tradeshow in Berlin, Germany. Lumalive textiles will be used in next generation fabrics to carry dynamic advertisements, graphics and constantly changing color surfaces. YouTube has a video of the Lumalive textile products worn by Philips' hostesses and embedded into booth furniture. More details about this new technology in the official press release here. Of course, for us Frenchies the City of Lights is the old/odd nickname of Paris. For us Entrepreneurs, Dreamers, and Danny Ocean' s fans it's also the nickname of Las Vegas. The City Of Light (note the singular) is a book by Jeff Hecht, published in 1999 : the amazing story of Fiber Optics. The expanded table of contents is available here. Order from Barnes&Noble here. More on Jeff himself on his own web site here. I have had the chance to meet with Jeff a couple of times in the late 90's. An exceptional writer, who puts simple words onto complex technologies.